This soup is easy and fantastic. Seven is a lucky number in Judaism so it is nice to serve something with “7” for the holiday! This soup is colorful and nutrient rich. I served it tonight for the Passover seder with these delicious matzo balls. Everything should be peeled and chopped to about the same size. In a deep pot, saute the onions in olive oil. Begin to add the other vegetables, salting each layer, as you finish chopping them. Cover with stock and water. Add as much dill and parsley as you like. Bring to a boil, reduce to a simmer and let it cook for about an hour. When it is done, turn the stove off and let it sit for at least 15 minutes. Using an immersion blender (you can use a regular blender, but I would not do this with piping hot soup), blend just enough soup to get a creamy consistency but with enough vegetables left in tact for texture. 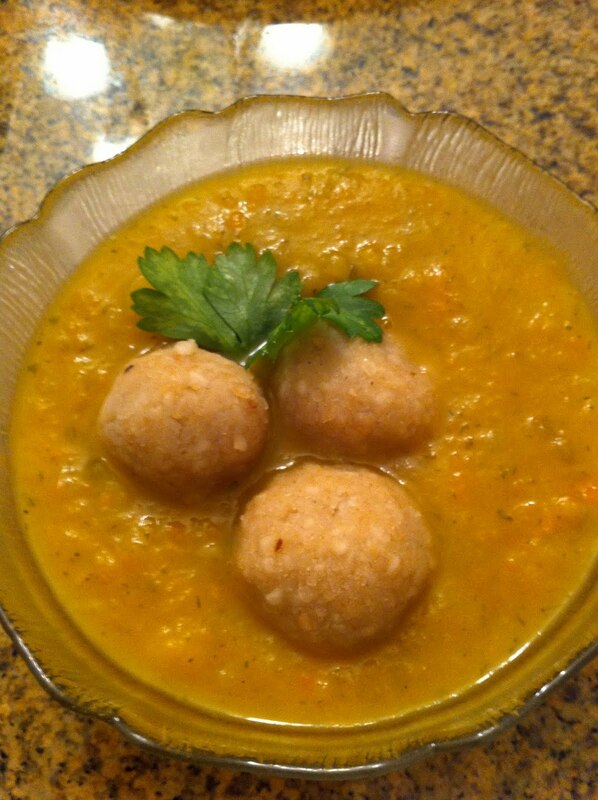 This soup is great on its own or served topped with matzo balls!